The Kentucky Derby prep season in New York has been dominated by the gray colt from Laurel, El Areeb. He will be back once again to headline the 65th running of the Grade 3, $300,000 Gotham. Expected to go off as the heavy favorite, he faces a few of the same foes he defeated last time out in the Withers, as the second-, third-, and fifth-place finishers from that race will all take another crack at him. The TimeformUS Pace Projector is predicting that El Areeb will be racing on the lead early in this race. However, that was also the case in the Withers before his connections decided to rate him despite a slow early pace. If they elect to employ similar tactics once again, horses like Miggsy, Action Everyday, or Withers pacesetter True Timber could find themselves leading the pack through the opening furlongs. #1, J BOYS ECHO (8-1): This Dale Romans trainee ships back up from Florida to make another run at El Areeb after finishing third in the Withers four weeks ago – and his connections have good reason to be optimistic. Of all the runners coming out of the Withers, this colt had the toughest trip. Breaking from the outside post in a 10-horse field, he found himself wide every step of the way. In fact, according to Trakus data, he traveled a remarkable 81 feet farther than runner-up True Timber, who rode the rail. Obviously, J Boys Echo would have handily defeated that runner with a ground-saving trip, but it’s also worth noting that he was racing against a mild rail bias, which seemed to be aiding runners with inside position throughout the day Feb. 4. Now he finds himself in a completely different situation as he draws the inside post. 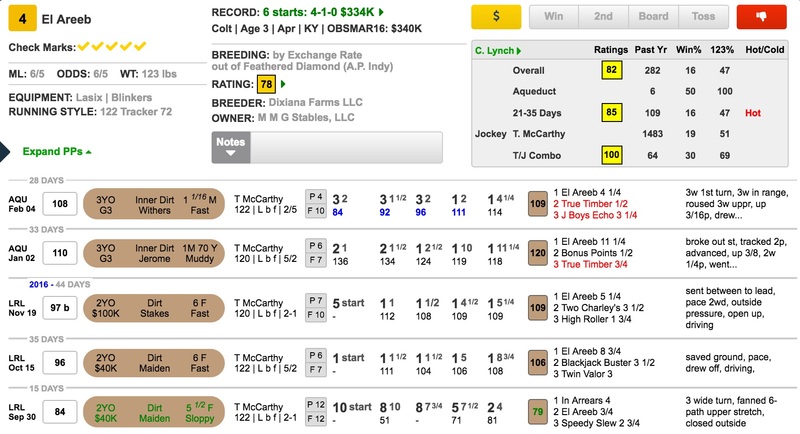 J Boys Echo showed in his Keeneland maiden win that he’s hardly a runner who needs to make an outside move, as he sliced through inside after finding himself in tight quarters at the top of the stretch. He’s yet to run as fast as El Areeb, but he’s had major excuses in his last two starts and is clearly improving. I still believe the favorite has the slight upper hand, but the gap may be narrowing. This colt appears to have the best chance of any to lodge the upset. #2, GAETANO (50-1): He’s been running slow races against far weaker company. #3, MIGGSY (15-1): The son of Hard Spun has done little wrong in his short career. He finished a fast-closing second Dec. 31 after racing wide against a pronounced rail bias. While he handled the stretch-out to two turns to win his maiden last time, it wasn’t the most convincing effort. The pace was on the quick side (note the red color-coded opening fraction in the PPs), and Miggsy probably made the lead too soon as he took over at the quarter pole. He nevertheless appeared to be on his way to an easy victory when he abruptly shortened stride in the final eighth of a mile and barely fended off his stablemate, who is also in this race. It’s possible that he will improve with that experience, but he’ll really need to do so to be a factor here. #4, EL AREEB (6-5): What is there to say about this colt that hasn’t already been said? It really seems like he can do it all. He possesses blazing speed and a spectacular, push-button turn of foot – the hallmarks of a great sprinter. Yet in both the Jerome and especially the Withers, he displayed the ability to relax early, waiting on Trevor McCarthy’s cues to use that speed of his. And when his rider has asked him, the responses have been just devastating. Like J Boys Echo, he was also against the grain of the track in the Withers, as he raced three wide around both turns and traveled 55 feet farther than runner-up True Timber. He has already handled the distance, and it seems possible that he could find himself stalking the pace once again in a familiar scenario. Some handicappers may be hasty to start questioning his stamina to get 10 furlongs and his overall merits as a Kentucky Derby contender, but none of that matters just yet. All El Areeb is being asked to do at the moment is win the Gotham, and it appears very likely that he will do just that. #5, GLENNRICHMENT (30-1): This quickly improving son of Pioneerof the Nile nearly ran down his stablemate Miggsy last time while making his first start in blinkers. There’s obviously some upside here, but he’s still a maiden and is spotting the rest of the field a ton of valuable experience. I won’t be surprised to see him race competitively in stakes races down the line, but this seems like too much too soon. #6, TRUE TIMBER (6-1): Just as he’s been doing so often during this inner-track season, Kendrick Carmouche’s decisive early maneuvering made a huge difference, and he deserves most of the credit for this runner’s second-place finish in the Withers. True Timber stumbled and basically went to his knees at the start of that race. Most riders would have immediately changed their plan and settled for a less-than-ideal trip after such an incident. But Carmouche, alert as ever, noticed that no one else was making a strong play for the early lead, and he seized the opportunity, sending True Timber up to take command heading into the first turn, even after the poor break. Yet praise for his jockey aside, there are some reasons to be careful here. As mentioned above, the inner track was favoring runners with inside position Feb. 4, and this colt was one of the few who rode the rail for the entire race. He was also setting a very slow pace (indicated by the blue color-coding in TimeformUS PPs). He probably didn’t run quite as well as it seems, and it would be wise to downgrade that effort. He’s still a lightly raced, improving colt who goes out for an excellent barn, but it seems doubtful that he’ll offer sufficient value this time. #7, APARTFROMTHECROWD (12-1): You can’t blame Chad Brown for making one more attempt at launching this colt onto the Triple Crown trail after he was bet down to 7-2 odds in the Withers. However, he’s hard to recommend here off that performance. While he was hardly disgraced in finishing fifth, he was no match for El Areeb and J Boys Echo despite getting a favorable inside trip while others were hung out wide. #8, SO CONFLATED (8-1): He kept solid company in his first two starts on the Southern California circuit. The fields he faced in those races have produced a number of runners who have been competitive in stakes, including top Kentucky Derby prospect American Anthem. While he was racing on the synthetic surface at Golden Gate Fields last time, he nevertheless handled the two turns without issue and displayed an eye-catching turn of foot in the lane after getting stymied in traffic around the far turn. There certainly are some things to like here, and I will strongly use him underneath the top two contenders in exactas and trifectas. #9, CLOUD COMPUTING (5-1): This is the wild card in the race. Bet down to just above even-money in his debut, he ran to that backing, registering a win over a compact but promising field. His effort was much stronger than the margin of victory would suggest given that he broke slowly and was steadied at the start. He did work out a decent trip thereafter but nevertheless did well to run down the leaders while earning a solid 105 TimeformUS Speed Figure. #10, ACTION EVERYDAY (10-1): He has one more start under his belt than Cloud Computing, but a lot of the same questions also apply to this colt. While he’s shown promise racing at Tampa Bay Downs, he’s yet to face a field of this quality. Furthermore, it’s not yet clear if he’s a true two-turn horse. He did win going a route of ground last time, but the result was not exactly conclusive. After appearing to have the race all sewn up passing the eighth pole, he got to drifting about and nearly blew his sizable lead as he appeared to tire late. It seems wise to be skeptical of sons of The Factor, who is known as a speed influence, going long on the dirt. There is a bit more stamina on the dam’s side of his pedigree, but I just get the feeling that the Chad Brown runner is a more talented horse. The two main players are El Areeb (#4) and J Boys Echo (#1). The Withers winner does appear to be the more likely winner of the two, but he’s going to be a very short price once again. J Boys Echo is listed at 8-1 on the morning line, and I would very much encourage anyone to bet him at that price. However, I think a more realistic line on him is somewhere around 9-2, and I would expect him to go off at around those odds. In any event, I’ll key these two runners over some others in the exotics.